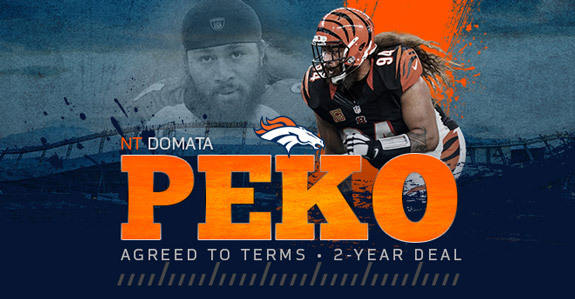 Today the Bengals lost one of their leaders on defense, as the Denver Broncos lured long time nose tackle Domata Peko away with a two-year deal. Here’s the story from the Broncos official site. 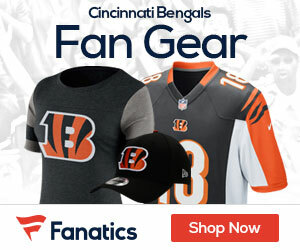 After signing two offensive linemen in the first two days of free agency, the Broncos beefed up the other side of their line Monday, agreeing to terms with nose tackle Domata Peko on a two-year deal. Peko, cousin of 2016 Broncos practice squad member Kyle Peko, comes to Denver after 11 seasons with the Bengals. The elder Peko has been a reliable defensive lineman, playing in all 16 games in 10 of those seasons. In Cincinnati, Peko recorded 516 tackles, 18.5 sacks, 12 passes defensed and two forced fumbles. Cincinnati selected Peko with the 123rd overall pick in the fourth round of the 2006 NFL Draft after he broke through as a starter at Michigan State in his senior season. That year, Peko recorded 53 tackles, one sack, two fumble recoveries, one forced fumble and a blocked PAT.